They say that the darker the henna stains your skin, the more your mother-in-law will love you. Itâ€™s two days before my sister Saminaâ€™s wedding, and my mother is telling me this for the first time. Weâ€™re sitting on our living room floor and watching the dark liquid as it is meticulously applied over Saminaâ€™s small, fair hands. I find this old wivesâ€™ tale strangely bizarre. 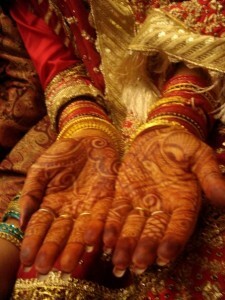 Is happiness somehow embedded in the maroon pigment that snakes elegantly up every brideâ€™s forearm? Yet my motherâ€™s hands are decorated modestly. I remember seeing snippets of her hands in old photographs. With her bright red nails and long fingers, her hands have the distinct look of being pampered. After she moved to America from New Delhi, India, my motherâ€™s manicured nails looked garish against the second-hand furniture that filled her and my fatherâ€™s tiny basement apartment. The bright red polish faded away, taking with it a youthful womanâ€™s vanity. For most people, beauty is a highly individualized trait, belonging to them and only them. For my sister and me, whatever beauty we possess does not belong to us. It belongs to my parents, acting as a reminder of a legacy they left behind. In America, where no one knows or cares about my fatherâ€™s family name or what family my mother came from, the aristocratic fair skin, the distinguished nose and big eyes are a marker of social importance and pride for my parents. For my mother, beauty is not a superficiality to be tossed aside. It is one of the only things that has not been lost in the cracks of assimilation. Though my mother has let her vanity slip away, she has held onto both of ours, jokingly telling both Samina and me never to get tan or cut our hair. By focusing on our beauty, she is telling us that we are worthy of something she is not. We are the manifestation of everything she has sacrificed. Our looks are not meant to attract attention. They are meant to show resilience. When my mother goes back to India, she embraces a vanity that has long since evaporated. She radiates exuberance, taking an interest in shopping and happily asking her sisters what looks good on her. Her behavior reminds me of the Lâ€™Oreal tagline â€œBecause Iâ€™m worth it.â€ In India my mother feels like sheâ€™s worth it. She feels a sense of entitlement. She dresses up to go to the market because she feels that people will notice her. In America she goes to the supermarket without so much as a glance in the mirror. My niece at 10 days old has the fair skin and the long fingers of my mother. She has the defined nose of my father and was born 20 inches long. â€œI prayed that she would be tall,â€ my mother said with a hint of satisfaction. This seems like a shallow thing to pray for. But for my mother, who has all but given up on her own vanity, it is not shallowness that fueled her prayer. Her prayer for beauty is stoked by a desire for us to know that no matter what country we live in, no matter how dark or light our henna comes out, we will always be worth it.